Play centurion in Soldier of Rome, a historic epic from Barcrest. The base game is played using a 7 reel, 50 payline game engine but this can expand to 100 lines if you trigger the bonus round. Look out too for mega stacked symbols, free spins and Big Bet modes where extra features become active. Stakes range from £1 to £500 per spin. The design here has a strong historical feel. Joining the lower value playing card suits are chariots, coins, eagles, a Roman ruler and a mysterious woman. She’ll get you 5 times your bet if you land 5 on a payline. The Roman soldier is the wild – he replaces all other symbols bar the bonus and free spins symbols and appears in 3 high stacks. The set up in Soldier of Rome is a little unusual. You’ll see 4 Money Burst Reels with only 1 visible symbol plus 3 Mighty Reels made up of 10 symbols (though only 5 of these might be visible). To start with all reels spin. The 4 Money Burst reels stop first, followed by the Mighty Reels. Land a winner on the first 3 Money Burst reels and you’ll receive an extended spin on the 4th Money Burst reel. Get a matching symbol there and you’ll be awarded the Lightning Spin Bonus feature. This opens up the top section of the Mighty Reels so each of them displays 10 symbols. During the feature, extras instances of the winning symbol from the Money Burst reels are added into play. Land a wild fully stacked within the bottom 5 positions of the Mighty Reels, then they open up the top 5 positions of the Mighty Reels and expand to fill the entire respective reel. Any other wilds also expand and fill their reel. Soldier of Rome also comes with a Free Spins Bonus feature which is triggered by landing 3 or more bonus symbols on the same spin. 3 bonuses will get you 10 free spins with 5 more free spins awarded for each extra bonus symbol. Once again, the obscured and open reels are in play. As are the expanding wilds. As usual for a video slot from Barcrest, you’ll be offered the chance to up your stakes and play in Big Bet Mode. This will set you back £20, £30 or £50 and gives you 5 linked spins with added extras. They include wilds that unlock the top portion of the reels if they hit partially, the removal of the lowest value playing card suits and the top reels active with 100 paylines throughout. Barcrest sometimes like to overcomplicate many of their offerings and Soldier of Rome is a case in point. The unusual set up and obscured reels take a little getting used to so we recommend a few plays in demo mode before risking your hard earned. Once you’ve got accustomed to the gameplay , are some decent extras on offer here. 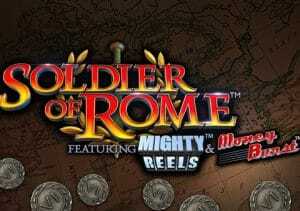 If you enjoy the ancient theme, then Soldier of Rome is worth considering. If you like the Roman theme, Gladiator Road to Rome from Playtech is an excellent choice.